Pro-Remain media and Brexit: unwise response to populism? Since the Referendum, the liberal élite and their media have largely neglected the societal threats inherent in the rifts exposed, while inadequately addressing the practicalities of Brexit. 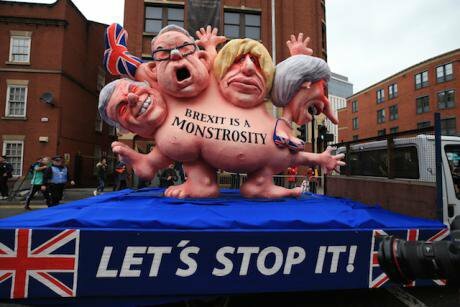 The Stop Brexit march on its way to the Conservative party conference at the Manchester Central Convention Complex in Manchester, October 1, 2017. Peter Byrne/Press Association. All rights reserved. Clueless, arrogant, outgunned. The attitude displayed towards the UK's Brexit negotiators in much of the media is derisive. Witness the treatment of July's notorious negotiating table photo opportunity: on one side, the European Commission behind piles of neatly stacked papers and, facing them, David Davis's team, empty table gleaming. Without pausing to consider possible explanations, reporters gleefully proclaimed that this demonstrated UK unpreparedness and the naive expectation that it could fly by the seat of its pants. Whether they have been responding to remorseless anti-EU propaganda from the right-wing press, fighting a rearguard Remain campaign, or simply failing to add enough nuance, our charge is that even influential pillars of the serious media, highly respected for accuracy and objectivity, have failed to provide fair coverage in the post-Referendum period. In so doing, The Guardian, The Times and the BBC, for example, exude pessimism about what is admittedly the hugely challenging and controversial process of implementing Brexit. This article examines the mindset that seems to contribute to the problem. We should first make our own position clear. Absent some significant political development, the UK will be leaving the EU and the Single Market; any future economic relationship with the EU outside the Single Market will be less favourable than market membership; a new relationship will, however, be far better than leaving without a deal; and, even though the economic terms outside the Single Market will be inferior, a pragmatic approach is required in order to make the best of a bad job. By no means all commentators share this analysis and rival campaigns are being fought both to keep the UK closer to the EU and to ensure a more decisive break with it. We have no sympathy with the latter campaign but in this article we specifically address what we believe to be problems with the former. It is both legitimate and understandable that disappointed Remainers should mobilise and the media is perfectly entitled to join in their efforts to campaign, for example, to stay in the Single Market. Leaving the market was not, after all, decreed by the Referendum decision. Whether this principle should extend to the actual decision to leave the EU is another question. It is in any case unclear how the UK could fit into a Union apparently aiming to revive its federalist aspirations. The media outlets we have referred to appear to be deploying some of their firepower in this direction. While this is entirely acceptable, to approach the issue in this way pays insufficient regard to the significance of the fact that more than half of voters, in declining to support UK membership of the EU, also revealed the depths of their political, economic and social alienation. Whatever the shortcomings of the Referendum, the extraordinary size of the Leave vote was a denial of popular legitimation to the European project in the UK. An élite-led refusal to accept this judgement risks stoking the discontent that had caused the populist insurgency in the first place. We believe that in these circumstances the highbrow media should moderate their campaigning zeal, strive harder for objectivity and impartiality, and focus more on how to help heal the divisions laid bare by the Referendum vote. In so doing, they should acknowledge more often that the Government is, however falteringly, seeking a replacement relationship with the EU that not only respects the winning Leave vote but also keeps the UK closely engaged with the EU. The media charge that the Government has been confused, divided and incompetent is by no means false. But all too often there has been a shortsighted failure to engage with sophistication in the complex Brexit debate and in particular to analyse the likely outcome in sufficient depth. The temptation has been simply to exaggerate weaknesses in the Government's negotiating position and underplay the availability of suitable options for a future partnership. There are, after all, clear indications that both sides intend to establish such a partnership and, in order to achieve it, the Government is gradually having to be more amenable to EU demands over the withdrawal. It is also clearer about its aspirations for the future than its critics give it credit for. And, whether one approves of those aspirations or not, there is at least political logic in its efforts to seek a close economic relationship outside the Single Market and without freedom of movement of persons. The EU has already entered into agreements with 'third countries' that create a relationship of this kind and there is no reason to doubt that this is what it has in mind for its partnership with the UK. The scant coverage of this in the serious media may be connected to genuine doubts about the Government's intentions or its ability to deliver. But if you ardently believe Brexit to be an act of almost unprecedented folly, you may also fear that practical consideration of the post-Brexit future somehow condones it. A stark fact should first be acknowledged: the UK is leaving the world's most advanced and successful supranational organisation, an integration project that has brought peace and prosperity to Europe. The opening words of its founding treaty spoke of an “ever closer union among the European peoples” – an overtly political aim. Equally important, and to a great extent achieved, are the Single Market's four freedoms of movement: goods, services, capital and persons. The major achievement of the EU is often said to be that it has prevented war, but the borderless trading advantages afforded by the Single Market are of huge value. More generally, many embrace the notion of European identity and the opportunity to live and work abroad. However it is not all positive. There have always been concerns about the Union's democratic deficit and in recent years we have had both the Eurozone debt fiasco and the uncooperative and unsatisfactory handling of the refugee crisis. Another problem has been the establishment of a modus vivendi with awkward members like the UK. The UK's relationship with the Union has been fractious throughout. It only joined in 1973, since when it has always been criticised as insufficiently 'communautaire' as they say in Brussels. Unsurprisingly, the UK refrained from participating in the single currency and the Schengen Area. But given the need to protect the position of the City of London, the creation of the Eurozone still complicated the UK's relationship with the EU to the extent that it contributed to what became Brexit. This is the context for our critique of the serious media's coverage of the post-Referendum period. The scene is set by the portrayal of negotiations where the Union is in the driving seat and a somewhat uncertain UK is a supplicant. This is a little misleading, although the EU has indeed provided the 'guidelines' for the negotiations and is clearly in a stronger bargaining position, in that failure to agree on terms, the notorious 'no deal', would in the long run be more damaging for the UK than the EU. Furthermore, the UK's position has been weakened by the self-inflicted loss of the Government's majority and the domestic challenges it faces on Brexit. Nevertheless, these are negotiations between two parties and the signs are that through gradual compromises significant progress has been made and that more will follow. In recent weeks, many of the issues on citizens' rights have been agreed, the UK has made a commitment to pay its share of the current budget, it has requested a transition period applying EU rules that will be interpreted by the European Court of Justice, and broad agreement has been reached on the principle of a unique solution to keep the Irish land border open. The UK position is that further discussion of the Irish border issues, and especially the financial settlement, is more appropriately conducted in conjunction with talks on future partnership. For example, the extent to which the UK would feel obliged to honour its commitment to the future funding of an EU scheme like Galileo is bound to be affected by any agreement on its continued participation in the Global Satellite Navigation System project. The same principle applies to the Erasmus+ programme as well as a raft of regulatory agencies, cooperation mechanisms and research initiatives. With the UK approach to negotiations still backed by an unconvincing bluff that 'no deal' would be an acceptable outcome, there is undeniably an element of brinkmanship. It is equally clear that the Government has been on a steep learning curve since the Referendum. However, in so far as there is a negotiating strategy, it appears to be to go along with the EU's guidelines. It now seems that the Government's patience may be rewarded in December, when it is anticipated that the European Council may finally agree to move on to discussion of the future relationship. In this way, the UK would have allowed the EU to assert its dominance by dictating the initial negotiating phase, while at least showing the ultra-Brexiteers that it does not immediately cave in to Brussels' demands. That concession of a 'little victory' to the EU might possibly persuade it to be more flexible in the important negotiation of the future relationship, which is in any case far less of a zero-sum game. These are immensely complicated negotiations and, so far, there has been a tendency for the serious media to pay too little regard to the nuances and too much to trivia and 'noises off'. The BBC's increasing obsession with the prospect and potential consequences of 'no deal', an outcome sought by neither side, exemplifies a tendency to focus on sensational, if somewhat improbable, eventualities. While acknowledging the differences between the parties, it is equally important to recognise the important common ground they occupy. Above all, both have said that they intend to establish a new close relationship to replace UK membership of the EU. The UK's Article 50 letter spoke of a new “deep and special partnership, taking in both economic and security cooperation” and a “deep and ambitious Free Trade Agreement”. The European Council has said that it welcomes a close partnership and added that any "agreement should be balanced, ambitious and wide-ranging”, while emphasising that it could not amount to cherry-picking of the Single Market. At this point one can only speculate what form this new partnership might actually take. Lobbying continues in favour of remaining in the Single Market, in practice via participation in the European Economic Area. But this 'Norway option' was flatly rejected once again in the Prime Minister's September 2017 speech in Florence. A partnership which maximises economic integration from outside the Single Market is, of course, another matter and the EU has negotiated multifarious deals of this sort with third countries, including recent ones with Canada and Ukraine. The Canadian model was also rejected as unsuitable in the Florence speech but the Ukraine agreement, involving a Deep and Comprehensive Free Trade Area, deserves more attention. The knee-jerk reaction might be to ridicule the very idea of finding a suitable model for the UK in an agreement with Ukraine of all countries, but this might be too hasty a dismissal. An enhanced trade deal like Ukraine's is typically incorporated into an association agreement, a wide-ranging and flexible partnership between the EU and one or more third countries. Another example is the European Economic Area Agreement which permits Single Market participation by Norway and two other nations. Interestingly, the use of such an agreement for future arrangements with the UK has been endorsed by the European Parliament. It could, amongst other things, facilitate the UK's continued participation in Euratom, various regulatory agencies, and EU initiatives in education and scientific research, while maintaining cooperation on vital matters such as security. While it would be facile to assume that the Ukraine precedent could simply be cut and pasted, the aim of its DCFTA is to achieve economic integration through extensive granting of Single Market treatment, arguably similar to the maximum access to the market sought by the UK. Notably, and of obvious relevance to the UK, the freedom of movement of persons is not mentioned as an aspiration. One might imagine that an arrangement like this would be exactly the sort of Single Market cherry-picking that the EU has ruled out. However, the EU guidelines covering this are very carefully worded, suggesting that it is specifically sector-by-sector participation that the Union excludes in order to preserve the integrity of the Single Market. It has not ruled out selective economic integration as set out in a single treaty. Moreover, while the four freedoms are declared indivisible, this is not the case in practice. Accordingly, we see no reason to exclude an agreement in principle along these lines, particularly if the UK is cooperative and generous on financial and jurisdictional implications of separation. If broad political agreement can be reached, the necessary technical work – such as establishing dispute resolution mechanisms and a powerful joint council to manage the partnership – could then be carried out during the transitional period and away from the glare of public scrutiny. So, there is at least the possibility of an acceptable outcome, even if it could hardly be characterised as breaking free from the shackles of EU regulation and jurisdiction, as Single Market access for the UK will depend on its continued adherence to EU rules. Whether the Government could retain its unity and summon the political skill and authority to finesse the deal with its more gung-ho Brexiteer backbenchers is a moot point. Their worldview often seems to neglect the fact that foreign market access is always dependent on observing trade rules which have to be arbitrated by a partly non-British quasi-judicial body. While there has been unofficial talk of 'punishing' the UK, long-term punishment is not in the interests of the EU, whereas a close partnership with Europe's second-largest economy most certainly is. And the EU would doubtless hope to achieve the necessary deterrence of other dissident members through the strictness of the separation and transition terms imposed on the UK. But this possible solution has more or less been neglected by the serious media. They have been right to skewer the patriotic bluster and free-trading aspirations of hardline Brexiteers but wrong to ignore a plausible alternative. Although leading authorities on the Ukraine deal believe it could be a model for the UK, to our knowledge only in The Times and in one article in the Independent has the arrangement received substantive consideration. To summarise, there is broad convergence in the aspirations of the UK and the EU for an ambitious partnership. An existing EU model offers a framework to satisfy those aspirations. There is reason to believe that such a framework may be what the UK has in mind. And consideration is being given to just such a solution within the EU. So, why is it that a comparatively positive outcome of this sort has received little attention from the UK's serious media? Why, in short, has the thrust of the reporting and commentary been focused elsewhere? Before delving into possible answers, it is important to repeat that anti-Brexit activism such as the legal challenge over Article 50, parliamentary opposition to the Withdrawal Bill, and the pro-EU campaigning of Tony Blair are all positive examples of democratic pluralism. Whether they pay sufficient attention to the concomitant societal risks that we have mentioned is another matter. In addition, so far as the coverage of Brexit by the serious media is concerned, there are specific troubling features, where the line between campaigning and objective journalism has too often become blurred. This is not, however, to suggest that there haven't been many honourable exceptions to what we see as a problematic trend. Newspapers routinely adopt clear editorial positions, often making their reaction to political developments predictable. Legions of politically committed columnists then buttress such editorial stances. But these prejudices have all too frequently seeped out from editorial comment and infected the news pages and current affairs broadcasts. Initially, this can occur with the selection of which story or angle to pursue. The Guardian or Channel 4 News, for instance, have to decide whether to investigate potentially positive aspects of Brexit or the opposite. The BBC's Today and influential interviewers like Andrew Marr or Andrew Neil choose which questions to put to which political leaders. Disproportionate commentary from outlying politicians like Kenneth Clarke or John Redwood distorts the actual balance of political opinion. In their different ways, the choice of expert analyst and the headline can both be very influential. In the case of Brexit, too many negatively spun stories suggest insufficient consideration is being given to these matters. The shallowness of analysis during the Referendum campaign was also much commented on and there has been little improvement since. If ordinary citizens were having to google the basic workings of the EU after they had voted, it has been painfully apparent in the post-Referendum period that some journalists and politicians are under-informed too. Whether it has been an over-reliance on vague shorthand such as 'hard' and 'soft' Brexit, the relationship with the EU of nations like Norway and Switzerland, or the reality of an ever-evolving and incomplete Single Market, there has been misinformation and superficiality throughout. Polly Toynbee wrongly informs Guardian readers that Switzerland is in the EEA, while considering herself expert enough to assume the role of the Prime Minister's Brexit speechwriter. Jeremy Corbyn, suspicious of the capacity of the Single Market's rules to obstruct his socialist vision, tells the BBC that formal membership is in any case only available to members of the EU. This is not only inaccurate but also a contradiction of his own party's policy for the transition, not that he received any challenge from his interviewer. All too often since the Referendum it has seemed as if the wrong questions were being put to the wrong people. As for superficiality, Euratom provides a notable example. Instead of informing the public on the possibility of using a new association agreement to maintain UK participation in the treaty governing the handling of atomic materials, the media turned it into a scare story about the possible suffering of cancer patients deprived of medical isotopes. Part of the reason for these shortcomings may lie in the fact that Brexit, while a hugely significant political event in its own right, was also a manifestation of deep-seated political and social divisions. Despite his personal allegiance to Remain, it was David Cameron, a Conservative Prime Minister, who called the Referendum and it was politicians and strategists from his party who engineered the Leave victory. This has contributed to the widespread rejection of responsibility for the aftermath by those on the left who supported Remain. Understandably, they consider Brexit a Conservative project and see no reason to assist in finding solutions. Yet it is not simply that Brexit is seen as a Conservative project, for the Referendum also raised more fundamental and divisive questions of British identity. For liberal residents of our outward-looking cities, a category which probably includes most people working in the serious media, EU membership was the key marker of the UK as a modern, diverse and tolerant nation. Such people view the vote to leave the EU as an indication that their country is moving in a highly unwelcome direction reminiscent of an inglorious imperial past. More personally, those who have taken advantage of UK membership to live and work elsewhere in the Union see Brexit as a betrayal. In addition, powerful psychological tendencies such as groupthink and confirmation bias, widely accepted as significant contributors to political and social attitudes, have positively thrived on Brexit. It has become almost de rigueur in liberal-left circles to talk about Brexit in derisory tones. Break that taboo and you may find yourself placed outside the group that defines your social position. So, rather than liberal tolerance, we have outrage. And it is difficult to understand other points of view when you are generally railing against the perceived regression of your country into extreme nationalism. With this as the mood music for the post-Referendum period, it is perhaps not surprising that the pro-EU media's coverage of the Government's strategy has been somewhat slanted. But that mood music distorts the reality of Brexit, which is a multi-faceted process. While the Referendum certainly has stirred ugly nationalistic tendencies, Brexit is a sign of social alienation and also consistent with the UK's long-troubled relationship with the EU. The incorporation of this nuanced analysis within the media narrative could have led to a more sophisticated post-Referendum conversation that did rather more than characterise Brexit as the culmination of a right-wing plot. The shock outcome might have triggered some self-reflection and a correction in assumptions and attitudes by the serious media. Instead, the cry went up that we were all doomed, and themes of Government disarray began to dominate. Not only has the negotiators' ability been questioned, but the media has cast doubt on the capacity of the UK to manage withdrawal. It is true that trade negotiation skills need to be reacquired and regulatory structures rebuilt but the UK is a rich country with highly respected diplomats, civil servants and lawyers to take on these tasks. Davis may deserve criticism for his air of insouciant chutzpah but it seems unfair to assume that he is not receiving any competent advice from this army of experts. The serious media have also been overly respectful of the portrayal of the Single Market by the Commission. The 'four freedoms' are in practice neither inviolable nor indivisible. Freedom of movement of persons was suspended for some acceding states and, unlike the other three freedoms, is entirely absent in the case of 'associates' like Ukraine. These shortcomings come at a time of acute national sensitivity, when media respect for the principles of impartiality and objectivity is more important than ever. In the immediate aftermath of the Referendum, the contemptuous disappointment of those who voted Remain was at least leavened by attempts to understand what had occurred, and an often-sympathetic narrative of marginalisation emerged in the process. The analysis recognised that a hardening of divisions in the UK between south and north, urban and rural, and young and old had contributed to the Referendum's outcome. While many journalists doubtless remained convinced that Brexit was an act of national self-harm, there was also a consensus that a London-oriented élite operating in a bubble had paid insufficient attention to, and failed to empathise with, compatriots who were far less content with the prevailing political and economic settlement. Regrettably, however, many commentators have over the following months reverted to the lofty tone that contributed to a protest vote against élite arrogance in the first place. Their attitude has occasionally diverged so far from impartiality, that even such a highbrow commentator as Times leader writer Oliver Kamm proclaims on social media that he sides with the Commission in the negotiations, because he supports the EU and doesn't support the Government. One of the problems with this cast of mind is that it gives the impression that the cognoscenti are relaxed about the extent of EU influence over the UK's political, legal and economic institutions but see little need to justify it to a more sceptical and ignorant populace. This supercilious detachment from the concerns of Leave voters is also well-represented in academia. The majority of experts were almost certainly right about the economic inadvisability of Brexit, but their views were either incomprehensible or irrelevant to the public. While it was, of course, appropriate for the media to reflect the balance of expert opinion, the gulf between expertise and popular opinion revealed by the Referendum demanded a more constructive response than satire at Michael Gove’s expense. To summarise, the Referendum threw a spotlight on deep fissures in the UK social landscape and its hollowed out democracy. Despite initially acknowledging this, the liberal élite and their media have largely returned to ploughing a similar furrow as in the campaign, neglecting the societal threats inherent in the rifts exposed and inadequately addressing the practicalities of Brexit. Meanwhile, the Government has bumbled its way into a slowly evolving pragmatic approach, as its parliamentary party struggles to hold itself together. If in due course this approach succeeds -- admittedly still a big 'if' -- discussion of the transitional period will follow and then eventually, after exit, the conclusion of a trade deal and continuing partnership in other key areas. While there are many roadblocks on the route, we suspect that the destination will be an association agreement of the sort we have described. Assuming it is reached, the reaction from pillars of the media such as the Guardian, the BBC and The Times will be intriguing. Last year, a discomfited London-oriented élite paused briefly to ponder the discovery that its complacent assumptions about the EU were so far from being a no-brainer that they had been rejected by over half of the voting public. If a wounded Government somehow staggers over the line to an orderly withdrawal and a reasonable deal with Brussels, the élite and its media should possibly undertake a more sustained bout of critical self-examination.